April | 2015 | ISE-HAKUSAN DOU'S "THE UNIVERSE"
I wrote about the relation between the land of Japan and a constellation in the article of September 19,2007. In it, I wrote that the location of Geku（外宮） of Ise Grand Shrine（伊勢神宮） corresponds to that of the North Star in the constellation in space. Geku of Ise Grand Shrine = the North Star. Seen from the earth, the North Star is in the center of the constellation. All of the stars which influence the earth move around the North Star. I feel the North Star, which doesn’t move among the others, is the star which gives birth to stars. The second most influential star which has had a great effect on civilizations of the earth is Sirius, which is the brightest star seen from the earth. I feel it has influenced all of the civilizations for the past 6000 years. From Egyptian civilization down, styles of building construction in Nara in Asuka period and the disposition of historic remains there reflect the position angle of Sirius in space. The development of civilizations comes with conflict, joy, anger, grief, and pleasure and growth and decline, etc. The North Star seems to have assigned the Sirius shining in the night sky to rule and manage the earth spiritually so that civilizations would develop on the earth. Now, the rule of Sirius is about to be over and we are entering the age the sun has a strong influence on the earth. Since Sirius is the brightest in the night sky, you can call it “the night sun”. The age to come is the time of transition from the age of Sirius to that of the sun. To be sure, Sirius is shining so bright in the night sky, but the brightness of the sun is incomparable with it. A big spiritual change, which corresponds to the difference in brightness between Sirius and the sun, is going to happen in the World of Reality. Mt. Fuji has been a symbol of the Japanese economic growth, but a mass of soil or rock on the mountain slope has been sliding down, which has become a real problem. Spiritual symbols and practical problems are always linked up together. A true secret of Ise and Hakusan, which has been sealed up for the evolution of civilizations, will be paid attention to more and more from now on. I hope that we live positively like the sun always cheerful so that we never feel guilty about anything. Something bright wouldn’t change if exposed to light. It would be brighter and brighter. But, what if you are in the negative state of mind? Those who would feel good surrounded by something gloomy are also forced to go into the spiritually bright age. Whether or not you can accommodate yourself to the change and the sense of feeling different will be a problem. According to my psychic reading, there was no spirit world or other spiritual dimension when the prototype of the human beings originated. There existed only two dimensions: the World of Gods and the World of Reality. God and creatures, men and animals, communicated with each other one on one. When humans died, they went back to the World of Gods directly. After a while, the souls transmigrated from the World of Gods to the World of Reality and this circulation was repeated. But as selfish minds grew in the human beings in the World of Reality, they came to have difficulty communicating with God and they ended up being unable to go back to the World of Gods directly. As a result, human souls began to stay between the World of Gods and the World of Reality. This space (=spirit world) appeared according to the sin, impurity, and stage of development of each soul and, attracting the same kind of spirits like a magnet, came to compose various spirit worlds or other spiritual dimensions. In the coming century, the world is to return to the ancient state where the World of Gods and the World of Reality only existed. As the first step, the World of the Dead, which has ruled the human race from behind the scenes over the past several thousands of years, will cease to exist. Many of the religions founded in the age of the World of the Dead have doctrines or spiritual traps such as incantation or magic words leading to the World of the Dead. Spiritual beings remaining in the World of the Dead are trying to drag the human beings living in the World of Reality with their Inner Gods in their hearts, into the World of the Dead by setting traps, inciting selfish desires or emphasizing mysterious efficacy. Susanoo（スサノオ）, part of Kunitokotachiohokami（国常立太神）, is watching over these traps in silence. In ancient times, there were no selfish humans. That is, from now on, only the humans who try to use even God for their own benefit will be caught in the trap. The key point will be whether or not you have gratitude and mercy. One of my Kenzoku-shins（眷属神, a guardian deity）told me that the Shikinen sengu（式年遷宮） of the Grand Shrine of Ise （伊勢神宮）held in 2013 would be the last one. By the time the next sengu is held in 2033, with things as they are, the modern civilization will come to a big turning point. To make a soft landing, we need “the 5-percent-of-the human beings movement.” The largest possible number of humans, even if it is 5 percent of the whole human race, have to be grateful just for being kept alive. If this is realized, things will pan out differently. NASA expects the activity of the sunspots between 2012 and 2013 will become the greatest in human history. “When the human beings are exposed to this strong electromagnetic waves of the sunspots and the spiritual sunlight, those who try to find out gratitude and mercy in their hearts in the present, chaotic world can look forward to what will happen,” a Kenzokushin said. The world full of gratitude and mercy would be fun. Looking at the belt zone between Ise（伊勢） and Hakusan（白山）, I find an interesting point in terms of Japanese modern economic growth. Many of the founders of the modern great Japanese companies such as Omi merchants who were active from Kamakura period to Recent period and Ise merchants in Edo period, are from Toyama prefecture, located on the line of Ise t0 Hakusan. Also, Nagoya City is one of the economically strong areas with a lot of global companies in it. These are all on the line of Ise-Hakusan. Since long time ago, people who were born in the area of Ise-Hakusan line have come up with new selling systems ,the basis of Japanese economy, or practiced adventurous, world-wide businesses. This area is in the middle of the Japanese Archipelago and is located at the abdominal region of the Great Dragon God（大龍神）.The wave motions this Ise-Hakusan line emits are the ones of “creation,” “rebirth,” and “evolution” of the Original God. As Ise shinto(伊勢神道）was originated in Kamakura period, there was a big change in the World of Gods of Japan in Kamakura period. I have been told by a holy spirit that the Sengu（遷宮）,the installation of a deity in a new shrine, of the Grand Shrines of Ise（伊勢神宮） , which is to take place in 2013, will be the last in the traditional form. The change of nature and the society will be huge. What happened in the World of Gods around Kamakura period will happen again, reflected on the World of Reality in this present era. Kamakura period was the age when a samurai with weapons ruled the country for the first time in the Japanese history and the invasion of China into Japan, called Genko（元冠）,occured. It was also the age when Buddhism（the Jodo sect, the Jodo-Shin sect, the Nichiren sect, the Zen sect) introduced from abroad also prospered. Toward the new age when the last Sengu will be held, Japanese people living in the present society, who have experienced an economically affluent era, are expected by the World of Gods to bring their spirituality into full play as the next stage of the soul. There was an important meaning in the economical prosperity of Showa era that they had to experience both the affluence in the babble economy and the subsequent void. Normal people would find it difficult to improve their spirituality in the state of starvation. Most people are likely to be more and more selfish as the society develops enough for them to eat well, but the times will flow in such a way that they are forced to turn to the starting point that they are kept alive. What God expected after making the Japanese economy strong in return for the destruction of nature was that a lot of human beings would have gratitude for being kept alive. In the state of Kannagara, you would take actions before thinking. The other day, which was a holiday during the equinoctial week, after visiting my family’s graves in the morning and having lunch, I lied down to take a break, when I felt uneasy about a matter suddenly. It was the place for drying clothes I had made by myself about three years ago. I made its roof as large as four tatami mats, which was attached to the back of my house. I spent several days making it hard out of wood and vinyl chloride galvanized iron sheets. It was proof against typhoons and heavy snow about one meter deep every year. It was the idea that I should get rid of it that day as it was sunny and the wind was gentle. The coming typhoon would be dangerous, I thought. I told my family about my pulling it down, which was so sudden that they were surprised. Unexpectedly, they didn’t disagree to it. Without the roof, my wife would have had difficulty drying up clothes, but she was not reluctant about it. I tore it down carefully with an electric saw and a nail puller. It was made of a large amount of wood because of its size. With care so as not to cut my fingers or legs with the electric saw, I managed to break it down into pieces by myself by the evening. And yesterday I asked a neighbor, who is kind enough to lend his small truck for 500 yen as the cost of gasoline, to take all the scrap material to the dumping ground of the town and could dispose of it. I had thought it would cost a lot of money to dispose of such a lot of scrap material in the city, so driving the small truck, I was thankful that I could dispose of it for only 500 yen. Normally, typhoons come in early fall, but from now on there is a possibility of huge typhoons coming much earlier because of the global warming. Also, in the coastal areas where a cold current caused by the dissolution of glaciers and a warm current meet, blasts with tornadoes might occur. As you practice memorial services for your ancestors and remind yourself of gratitude to gods in the right way, you’ll come to be in the state of Kannaraga（カンナガラ), which means “to live with God.” God doesn’t come from the outside but it has already existed in everyone’s heart as their Inner God. It depends on you whether you have it appear on the surface of your heart or you confine it deep in the heart. In the state of Kannagara, you comes to act naturally before thinking, like “No time like the present.” And the consequences will turn out to be good. When you’re troubled, on the other hand, it will be better to stop to think and look at your situations objectively, and you can find another way out. Please be careful of typhoons or storms from this year on. If you cause any troubles to neighbors, you’ll be in trouble financially and emotionally. In the age to come, what we’re thinking appears on the face. This morning, I remembered Mr.Horin Matsuhisa (松久朋琳,1901-1987）, a famous sculptor of Buddhist statues living in Kyoto. When I was a student, I got the urge to see his workshop and his face on seeing a Buddhist image created by him. Where he lived was not made public, but I knew he lived in a certain district of Kyoto. One early morning of a holiday, I remembered Mr. Matsuhisa suddenly. Feeling I could see him that day even just a little, I couldn’t sit still. Then I left home riding my motorbike with a map in hand. I succeeded in reaching his home without difficulty as my guardian deities guided me. The doors of his workshop all taken off , the place was opened to the public. Wondering if something happened, I stood in front of the workshop,when I found that an altar for funeral was set in the back and a picture of Mr.Matsuhisa was decorated. They were preparing for the vigil. He was smiling quietly in his picture. Seeing the picture, I thought I did meet him even just a little. The atmosphere around his house was filled with silent, bright dignity. Then I felt that a funeral for a person who lived his life to his heart’s content and became one with Buddha is a bracing and positive one. I could perceive him saying like “That’s a load off my mind !” He was happy to take off his physical body like a heavy suit of armor. Mr.Matsuhisa once said, “Buddha is in everyone’s heart. I carve the Buddha out of wood to give it a figure and welcome him. 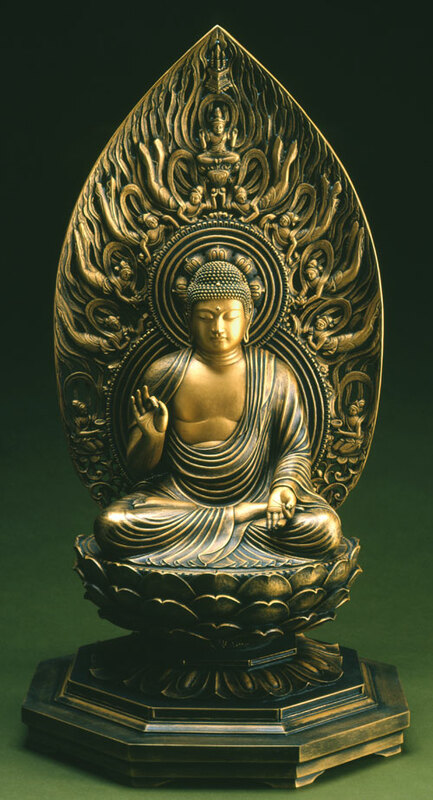 And by welcoming him, the Buddha lives in the sculptor’s heart.” I think this means that he feels his Inner God and by making it a wooden image he can remember Buddha in his heart all the time. It is important that we human beings work hard for a living in a mundane secular world. But overwhelmed with difficulties in life, we are apt to forget our God inside us. He recommended carving Buddha so as not to forget it. In Showa era, it would have been a good thing to do. But in the age to come when spiritual sunlight pours down on us, what we think appears on the face. So from now on, instead of carving an image of Buddha, we should “carve” our face by holding memorial services for our ancestors and reminding ourselves of gratitude. The improvement of blood flow is important. I hear that people whose body lacks flexibility are apt to get injured and fall ill easily. For example, in Judo, such people are poor at taking a defensive pose. The same thing is true of human minds. Stubborn people tend to take what others say too seriously and cling to it. Most of it are usually trifle and they are likely to take it wrong or misunderstand it. Well, what makes them so stubborn? The followings are some of them. ● They haven’t gotten over their past sad incidents. ● They have suffered from stress in daily lives. ● They focus on themselves so much that they cannot afford to pay attention to their surroundings or those around them. ● They have a propensity to cling to things and no gratitude for the present situations. However, these causes are superficial ones. Why are they so? Because there is a problem in the state of a spiritual line connecting their spiritual body to the spirit world. The state of mind is reflected on a spiritual body, and then the state of the spiritual body is reflected on the physical body. The life energy sent from the Original God through the spiritual line of a family line has influence on both a physical body and a spiritual one. When the spiritual line is clogged, the life energy decreases, and as a result, the person becomes unable to afford to look around and stubborn. 1. ancestral spirits who haven’t rest in peace (haven’t circulated). 2. spiritual dirt caused by praying to some outer god or depending on pay psychics because of the avoidance of efforts and the escape from reality. As to 1, you must not leave the problem to others. If you pay a lot and have someone else hold a memorial service, it’s no better than a placebo, for the spiritual truth is that memorial services held by descendants can only have effects on their ancestral spirits. Ancestors and descendants are connected to each other by DNA, through which spiritual interaction occurs. Married wives, whose spiritual line has been changed to the one of her husband’s, are connected to her husband’s family line through a spiritual DNA other than two physical DNAs. To purify your blood vessels it is important that you make efforts, such as improving your diets or taking exercise, as long as you live. To have surgery by a well-known doctor at a great hospital doesn’t necessarily mean that your disease associated with the circulatory organ will be cured completely. You have to take care of your health (=holding memorial services) every day. Similarly, descendants connected to their ancestors in terms of karma too have to hold memorial services for them every day. Regarding 2, we have come into this world at long last as the result of our being given a chance by God after we chose our own subject we should accomplish in this world. We, however, reveal our true nature once we were born forgetting the memory. We are apt to depend on others trying to escape from the subject we’ve chosen. And as a result we attach spiritual dirt of others to ourselves though we think we’ve found an easy way out and gotten benefit. This is an escape from life and a defeat in a deep sense, in which case Inner God would hide itself deep into the heart feeling sorry and we couldn’t improve our fortunes. The world of human minds will begin to affect the World of Reality strongly. When the electromagnetic waves from the sun intensifies as never before, it is as if the whole earth were put in a microwave oven, which causes the temperature to rise from inside. As a result, the ice of the North and South Pole will begin to melt from deep inside. The melt of glaciers on the surface of the earth because of global warming is slight compared with the influence of electromagnetic waves from the sun. The speed of rise in sea level will exceed the expectations of scientists. There is one more serious thing which will promote global warming. The permafrost expanding from Russia to Northern Europe will begin to melt and its leaf mold accumulating deep underground will begin to ferment. Also, The leaf mold accumulating under the ground of the Amazon and the equatorial region will begin to combust spontaneously. The amount of carbon dioxide and gas caused by these natural phenomena will be several times as large as that caused by modern industries. In addition, the rise in temperature from the inside of the earth will cause groundwater to dry up. I went into a woodland for the first time in a while yesterday. In my spiritual vision, I received a warning from a natural spirit that the trees in the mountains could begin to wither suddenly and all of the mountains could become bald. When Nature has gone, so have myriads of gods. 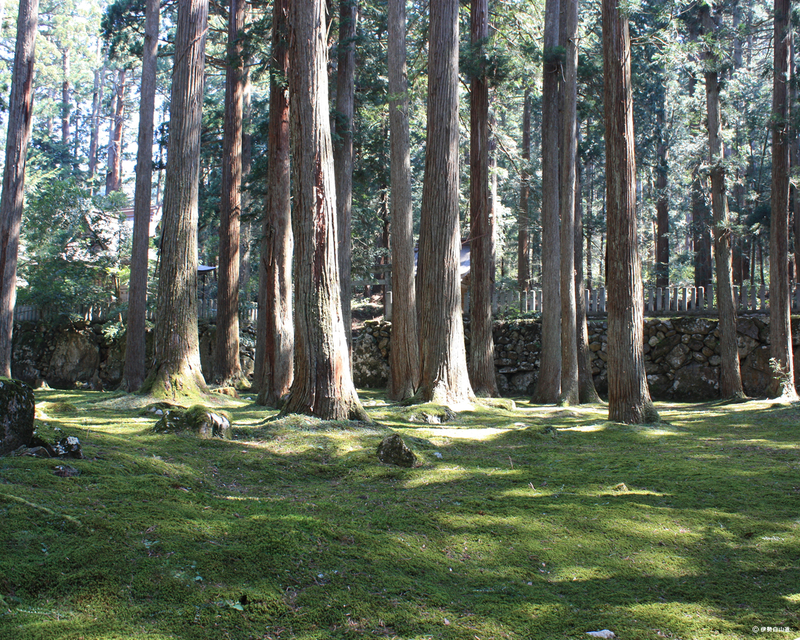 The revelation I received at Ise Grand Shrine that the world would change from a vertically-structured society to a horizontally-structured one seems to hold true of the world of gods. From now on, the minds of human beings will act more and more strongly on the World of Reality. The key to prevent disasters is gratitude for the present situations living humans give off. This will, and has to, overwhelm material phenomena and improve the situations. It is only living human beings that can save gods. The age is over when human beings are dependent on holy spirits. The age is about to begin when human beings help natural spirits and gods.